Those of you who’ve already used the world’s most popular search engine this morning likely were greeted by a brief animation: A woman operating an old-school, room-sized computer, which spit out the number 107 and what appears to be a moth. It’s an unusual place to find a visual representation of Navy history, but it’s an honor, nonetheless — the Google “doodle” comes on what would’ve been the 107th birthday of Rear Adm. Grace Hopper: primary developer of the Common Business Oriented Language, better known as COBOL, and an officer whose career spanned five decades. Head to Naval History and Heritage Command for the full write-up, but even the short version is remarkable: After earning advanced degrees in mathematics and physics from Yale in the 1930s, Hopper joined the Reserve in 1943 and was summoned to active duty, becoming the first programmer on the Navy’s room-sized Mark I computer at Harvard. 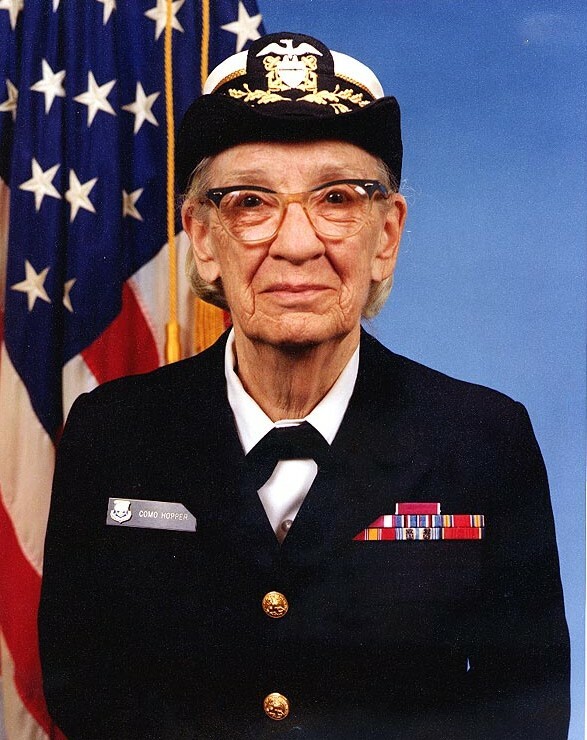 She left active duty in 1946 but stayed at Harvard, developing new Mark models and eventually retiring from the Reserve in 1966. The next year, she was on active-duty for what was supposed to be a half-year assignment assisting with the Navy’s data-processing automation efforts; 20 years later, she retired again, involuntarily, a year after advancing to rear admiral. She died in 1992; the destroyer Hopper was commissioned in 1997. Why the moth? In addition to the heavy lifting Hopper performed in forwarding the computer age, she also helped along the slang — when a moth flew into the Mark II and caused a computer error, she pulled it out and taped it into her log book, creating the concept of a “computer bug” and an image that’s appeared in too many tech and Navy publications to count (and yes, that’s it on the right, again). More about Google doodles here. More takes on the honor here and here. 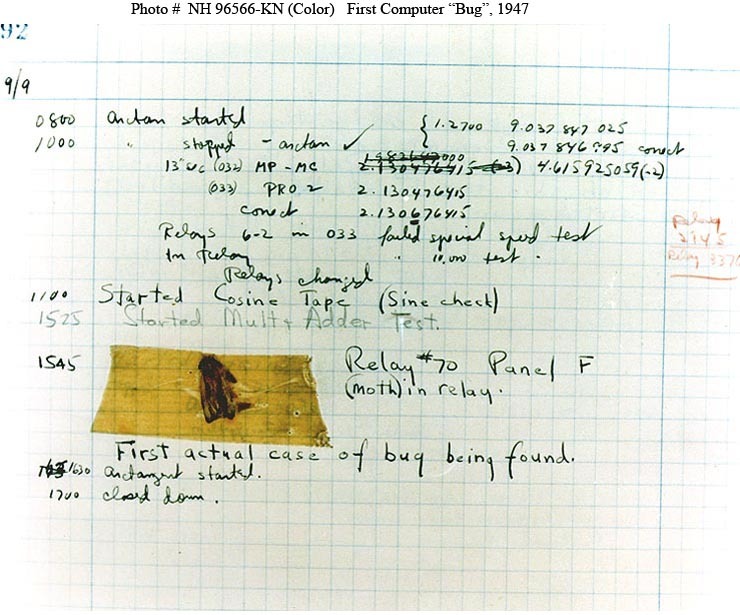 While it is true that this is the first physical computer “bug”, the term bug was already in use for problems before this. E.g. I have a copy of a Newsweek magazine from mid 1942 that has an article referring to “working the bugs out of the new pursuit planes” (What the USAAF called fighters at the time). I had the honor and priviledge of attending Adm. Hopper’s lecture my Plebe Summer at USNA in 1984. This lady was fantastic! Her lecture was amazing, funny and inspirational! Perhaps one of the best lectures I attended at USNA in the 4 years by the bay. I can say that my Systems Analysis BS is thanks to Adm Hopper’s atitute towards life. My Dad worked with then-Commander Hopper for many years. She was incredible. I loved her backwards-time clock when I was small! Our daughter, now 40+, was flag captain of the Chambersburg (PA) HS color guard, and led the color guard accompanying Adm. Hopple as she rode the lead float at the Orange Bowl parade in the late 1980s. It poured rain the whole time, but I did get to see them starting the parade! I knew of Adm Hopple because I had been in the Navy using CoBoL and part of our training included learning about her. It’s wonderful to see an article about Commodore Hopper, learned about her in bootcamp and was proud to learn the magcards, now I’ve a laptop; unbelievable how far the computer has come since then. A great lady whose contribution in the U S NAVY will be written in golden words. Lucky are those countries where such people are born. I pray she also gets peace in the next world.